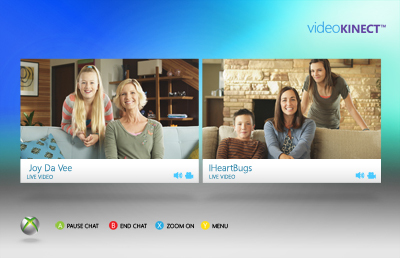 Select Browse Apps, Social, and then Video Kinect. Select More Friends, and then find someone to chat with. Auto Zoom: tracks your movement and centers you on the screen (this is on by default). Video Kinect is smoothest when you have good room lighting. If the video is not smooth, try increasing your room lighting. Another possibility is that your Internet connection isn’t fast enough. Video Kinect works best if you and your friend have a high-speed Internet connection (at least 540 kilobits per second or Kbps). For the best performance, an upload and download speed of 700 Kbps is recommended. See the Xbox Live Slow Performance Solution for help. 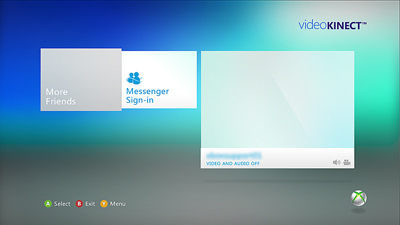 Video Kinect can’t be started if a profile subject to parental controls is signed into your console (child accounts are restricted from Video Kinect by default). To change online safety settings, see Xbox 360 online safety and privacy settings for child accounts.